​Sue Thompson was brought up by artistic parents. Their influences led her to a career in art. She attended Waterford Mott High School and Central Michigan University where she received her undergraduate degree with a double major in art and physical education. She continued to study art and received a master’s degree from Wayne State University. In the public schools, she has taught art in all grades 3-12. She taught for the Algonac, Manchester, and Onsted School Districts. During her time in the public schools, she received teaching awards including the MAMSE State Teacher of the Year, Michigan Department of Education Exemplary Teacher, and Lenawee Council of Exceptional Children Outstanding Teacher. Her students were also recognized at the State Art Show, Top 18 Show, and Governor’s Traveling Show. She began teaching art at the college level in 2007 at both Siena Heights University and Adrian College. At Adrian College, she has been the Coordinator of Art Education, Art Education Club Advisor, Art Student Teaching Supervisor, Art Education Methods Class Instructor, and 2-D Design Instructor. Annually, she presents at the state art conference and local workshops. She has taken numerous college students to the MAEA State Conference and had students win the State College Art Student of the Year Award. Sue is a watercolor and mixed media artist. 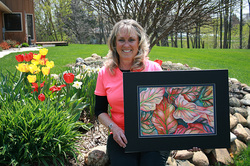 She is also a member of a local artists group and has taught numerous watercolor classes. She is married to AC alumni, Jeff Thompson and they have a son, Austin. As a family, they enjoy traveling, boating, golfing, and downhill skiing.